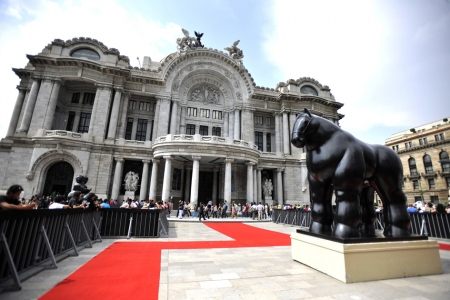 Despite the financial and organizational struggles that have plagued the Mexican Academy of Film Arts and Sciences the past few years, the 54th ‘Mexican Oscars’ took place last Saturday night in Mexico City’s splendid Palace of Fine Arts, the home of such grand mural masterpieces by David Alfaro Siqueiros, Diego Rivera and José Clemente Orozco. Most of the wins were divvied up between gritty crime action thriller, Dias de Gracia, written and directed by Everardo Gout, and Pastorela, the hilarious Christmas play comedy written and directed by Emilio Portes. Both films are highly stylized and accomplished first features. Technically, the most wins went to Dias de Gracia which took eight awards, but it was Pastorela that had the most coveted awards bestowed including Best Film and Best Director. Although Gerardo Naranjo’s cinematic tour-de force, Miss Bala was nominated for Best Film and Best Director, and submitted for best foreign language Oscar, it walked away empty handed – a puzzling snub if you ask me. Another curious upset was documentary Presunto Culpable, a social justice exposé which got a lot of attention for its unprecedented box office success in early 2011. The award for Best Documentary went to a more recently shot documentary, the poignant El Salvador set film, The Tiniest Place, by Tatiana Huezo. Carlos Carrera (El Crimen de Padre Amaro, Backyard) and current president of the Mexican Film Academy. In his opening remarks the president of the Mexican Film Academy, Carlos Carrera, filmmaker of the biggest Mexican box office hit ever, El Crimen de Padre Amaro, called to task the presidential candidates to support national cinema, citing the appalling lack of Mexican prints in movie theaters given that 90% of Hollywood films dominate the screens. At the Cannes Film Festival – MexiCannes! In addition to the appeals directed at the government to support their culture through cinema, a number of actors and filmmakers taking the podium expressed their support to the popular university student movement #YoSoy132 which sprang up a few weeks ago and has mobilized and inspired protests. The vociferous demands are mainly directed toward the candidates and the two media empires that monopolize and dictate the status quo (for the right price as the implication goes), Televisa and TV Azteca. The moniker “I am 132” comes after Peña Nieto’s speech at a university where apparently 131 students “severely” questioned the candidate. He was quick to dash out instead of engaging his vocal audience, and his party later claimed the students were being overly antagonistic. The students quickly countered that there are more than 131 citizens who demand a “True Democracy”. The movement is picking up steam ahead of next month’s Presidential Elections. 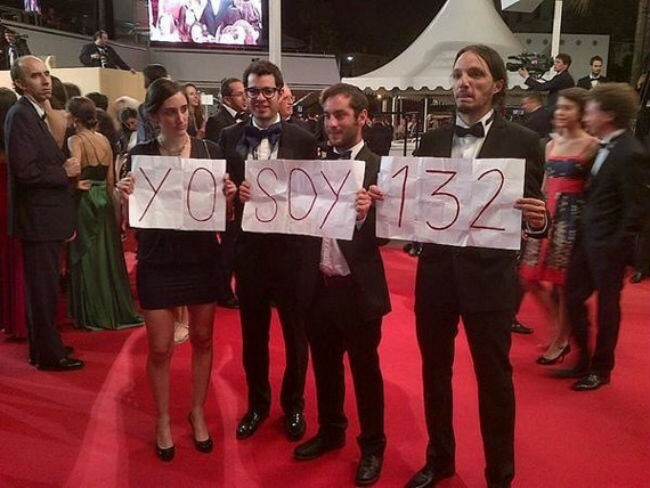 Oscar nominated Mexican actor Demián Bichir posted on a video on youtube in support, and last week pics from Cannes at Carlos Reygadas’s Post Tenebrus Lux screening showed black tie clad Mexicans holding up signs of the movement. Dias de Gracia and Pastorela offer substantial socio/political commentary underneath their furious hybrid genre mashups of action, comedy and horror. They speak a lot to contemporary Mexican culture and traditions, and most importantly are accessible, having proved their commercial appeal at the multiplex. Dias de Gracia is anchored in three different World Cup circas, 2002, 2006 and 2010 and follows, among other characters, a cop named Lupe who climbs up the ranks to special type of undercover ops at the behest of his comandante. The title, Days of Grace refers to the season in which gangs, distracted by the fervor of their national past time, lower their guard, marking a good time for cops to move in. The film ends on a vicious circle note in which you see how the brutal jungle transforms and hardens even the best of us. A reminder that the longer the war persists, the more havoc and darkness is perpetuated upon on our souls. 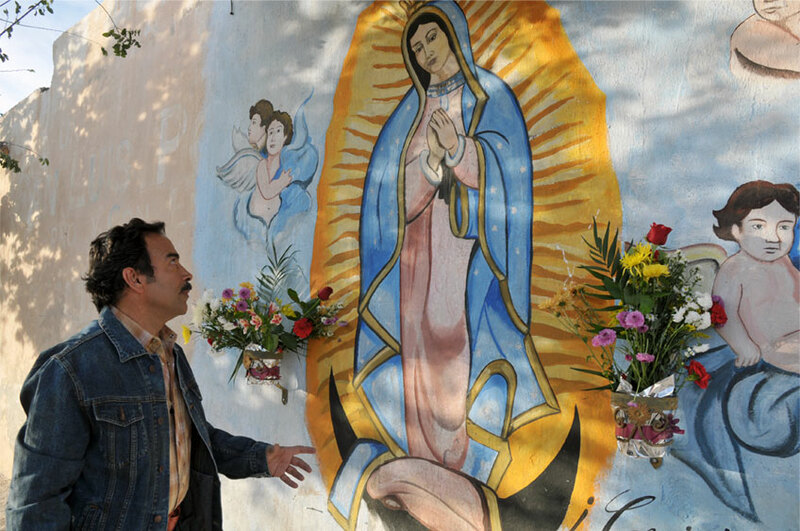 Pastorela, a wicked morality tale about a cop, Chucho, who gets pissed when his role as Devil in the town’s annual Nativity Play is taken away by the new Father, is similarly very much embedded in a deep Mexican tradition, the ardent Catholic habit of community Nativity Plays. With swearing and fighting priests, a transgressive devil turned angel, and devil costumed people running loose in the streets, the film is an outrageously funny take on good versus evil, rife with metaphors, and subtext about the corruption in every thread of a community’s fabric. It’s got a lot of substance ripe for interpretation, I read an interesting review on this Catholic Movies site for instance. In one memorable scene Cosio’s character calls an ‘associate’ who is in the middle of supervising a torture scene off camera and their easy “How are things” banter and flippant response, points to just how mundane if not, matter-of-fact things are day to day. Like Lupe in Dias de Gracia, Chucho is a likable tough guy in a mid level authority role, and someone who undergoes an inadvertent transmutation in response to his surroundings. A still from El Infierno by Luis Estrada – a horrifying allusion to the real life “Pozolero” who was arrested and confessed to being a lackey paid by narcos to melt body parts. Like last year, Mexico’s ongoing violence is reflected in the nominated films. The bleak survivor -esque tagline of Dias de Gracia is “Every day is a gamble in Mexico City… most don’t live to tell it”. Luis Estrada’s black narco satire, El Infierno, swept last year’s Ariels and rocked the box office. Taking a look at the Best Films from 2000-2010, none have been as outright of a social realism commentary, besides perhaps one vignette of the celebrated Amores Perros in 2001. One thing I happily notice in the three films nominated for Opera Prima, Best First Film; A Tiro de Piedra, a true indie and beautifully shot journey film by Sebastián Hiriart, Tiniest Place, and Dias De Gracia, is that it represents a fresh, diverse slice of genres that demonstrate the story versatility and personal voices of Mexico’s young filmmakers – unlike the previous floodgate trend of Reygadas wannabes. It’s no surprise that Dias de Gracia swept the score, soundtrack and sound design awards. Below is a video in which Everardo Gout shares the conception and music process of the film (in Spanish). In an effort to give each era its own aesthetic and sound the filmmaker chose a brilliant roster of composers; Atticus Ross (Social Network), Shigeru Umebayashi (Wong Kar-Wei’s films) and Nick Cave and Warren Ellis. The soundtrack gives a lot of flavor and texture, from one of my favorite forgotten Bronco songs, Amigo Bronco, to the different versions of the song, Summertime, the sensual Janis Joplin guitar riff and the recent version by Massive Attack featuring Scarlett Johansson. Over the weekend Mexico’s highest film honors, the 53rd Ariels’s, presented by the Academy of Mexico’s Arts and Cinematographic Sciences bestowed Luis Estrada’s graphic and popular narco-comedy EL INFIERNO with Best Picture, Best Director and Best Editing among others. Exactly matching his last sweep in 2000 for the nine Ariel Awards given to Herod’s Law, Estrada is no stranger to pushing his polemic and popular. Once again this brilliant satirist has proved his unmistakable timing for capturing Mexico’s social quagmire. In this case, the real life violence that is right now engulfing the country. Also of note, the only win for Alejandro Gonzalez Iñárritu, more beloved outside his country than within, was for Best Photography, winning only one of seven nominations. Damian Alcazar’s El Benny role in El Infierno beat out Javier Bardem’s heavy turn in Biutiful. And Best Supporting Actor went to prolific actor, Joaquín Cosío who has gifted the Mexican public with the indelible wild and human character of “Cochiloco”. Diego Luna shared the Best Screenplay win with his co-writer, Augusto Mendoza for the sophisticated and subtly poignant Abel. Taking Best Opera Prima was last year’s Cannes winner, Michael Rowe, for his transgressive sexual tale about isolation, Año Bisiesto. One major snub in the documentary section is for the complete omission of Presunto Culpable, the most imperative documentary film of this year which exposes the outrageous incompetence of Mexico’s justice system. It’s likely that the box office and now critical success of the bastardly violent narco trafficking El Infierno will unleash more narco-tales and open up the floodgates of a brutal noveau Mexican cinema. Hours before its world premiere in Cannes, Gerardo Naranja’s fourth film , Miss Bala about a beauty pageant who is unable to escape the drug violence reality she is surrounded by, is the newest inclusion in the narco film trend emergence. While El Infierno did not travel nor was received as well outside (for reasons unknown it was shockingly not considered for Mexico’s submission for the Oscars Best Foreign Film), it stirred up wildly positive and negative acclaim and controversy within Mexico. It proved the exception to most Mexican films which are seen internationally but not necessarily by the Mexican public. Gerardo’s films have had success both within and outside Mexico (Voy a Explotar was released in Mexico and shown in U.S. Festivals, and he has participated in Cannes previously with Drama-Mex). Known for his intuitive beat on angsty youth, Naranjo is highly adept at portraying beautifully moving desperation and ferocity . Just announced, Fox has picked up Miss Bala for distribution in Mexico and will unspool in theaters in September. I’m deeply interested in tracking and engaging in dialogue on how these break-through films about Mexico’s drug war are entwined with the real struggle. This Sunday an enormous demonstration is taking place in Mexico City’s Zocalo Plaza. The March for Peace has ignited people young and old to protest President Calderon’s seemingly impotence to counter-act the rising and continuing outrageous cartel violence. The massive mobilization has been in part organized by poet Javier Sicilia who like hundreds of civilians has suffered the misfortune of losing a family member to the severely indiscriminate violence. 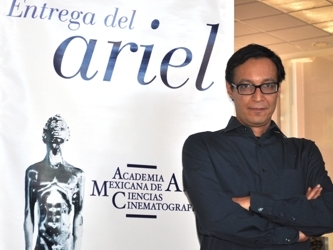 The name of the Mexican film award Ariel is inspired by Shakespeare’s Tempest Fairy, The Ariel of the Ideals. Far from my beloved motherland, I send out my wishes in solidarity to the March for Peace and I would like to envision Ariel showering her magical spirit among the people as they call out for change and search for consolation in these times of suffering and despair.